Poultry Science: What Chicken Breeds Should You Choose? You might want to raise chickens for eggs, meat or the aesthetics of the birds themselves. 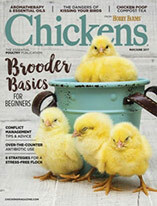 This overview covers traits of several common chicken breeds. Chickens are quirky social creatures, and compared with other farm animals, they are relatively easy to raise and don’t require large amounts of space. In addition, chickens provide fresh eggs, and their meat serves as an inexpensive source of high-quality protein. For all these reasons, it’s no wonder that backyard chickens are becoming increasingly popular again in the U.S. Whether you want to show chickens or raise them for eggs, meat or both (so-called “dual-purpose” chickens), there is a breed right for you. 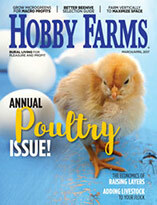 This column provides a brief overview of some common backyard poultry breeds and helps you identify what characteristics to consider when choosing your next backyard birds. Keep in mind that we generalize each breed here. There are, of course, outliers. For example, while you might have an ornamental breed that produces six eggs a week, this is not a common result. Hence, we focus on common outcomes so poultry enthusiasts can make the best decision for their own backyards. Ornamental breeds are usually bred because of their interesting looks and not so much because of their high egg or meat production. Cochin: While these hens are not the best layers, averaging only two eggs per week, they have remained a favorite among backyard poultry enthusiasts because of their unique curved necks and short but fluffy tails. This breed is also hardy in the winter, adjusts well to confinement and is known for its friendly and peaceful demeanor. Polish: The large crest of feathers at the top of its head and v-shaped comb make this bird (pictured below) special. However, Polish don’t make very good layers. Specifically, on average, hens will lay two typically tiny eggs per week. At 4 to 5 pounds in weight, Polish also don’t make for very good meat birds. Nevertheless, they are docile, friendly and quiet. Silkie: The Silkie is easily recognizable because of its black skin, hairlike feathers and head puff. While it is a smaller breed, weighing just 2 pounds, it produces an average of three small eggs per week. However, its sweet, friendly and fun personality has made it popular among backyard poultry-keepers. The Silkie is often considered a good breed choice for families with children. (Note: The U.S. Centers for Disease Control and Prevention recommends that children younger than the age of 5 should not handle chickens due to the risk of contracting pathogens such as salmonella by touching chickens and then touching their faces and mouths). If your main interest is to have fresh eggs daily, here are some egg-cellent layers. Ameraucana: On average, this hen will produce three medium eggs per week in varying shades of blue and green (examples of which are pictured below). Additionally, it has a sweet and gentle disposition in combination with hardiness in the winter and an ability to adjust well to confinement. If you don’t have the option of letting your chickens roam on pasture and you live in a colder region, this bird is worth considering. Ancona: This hen lays a whopping average of five large eggs per week. Similar to the Ameraucana, the Ancona is hardy in the winter. However, it prefers large spaces and tends to be more active and flighty, preferring to avoid humans. Therefore, if being able to socialize with your chickens is important to you, and you can’t them free-range, consider another breed. Lakenvelder: Similar to Ameraucanas, Lakenvelders lay about three medium eggs per week. However, unlike the Ameraucanas, their eggs are usually a cream or tinted color. Lakenvelders are not especially docile. In general, all Cornish crosses are productive broilers (otherwise known as meat birds). Cornish: While these birds can grow to 8 pounds or more in as little as six weeks, they don’t make very good layers. On average, cornish hens produce one small egg a week. Nevertheless, they are hardy in winter and do OK in confinement, though they tend to be flighty around humans. If you want a bird that is suitable for the table and productive as a layer, you’ll want a dual-purpose breed, such as one of the following. While these breeds are supposed to be good at laying eggs and putting on the pounds, they won’t be as superproductive as the breeds solely focused on egg laying or meat production. However, as the name “dual-purpose” implies, they can be pretty good at both. Rhode Island Red: This breed (pictured in the photo at the start of this post) is a favorite among backyard poultry enthusiasts. It really seems to have it all. Rhode Island Reds are rapid growers and heavy set—weighing an average of 7 to 8 pounds—while also being productive layers, producing five extra-large eggs a week. To top it off, they do well in all sorts of climates and in small housing areas and tend to be easygoing. 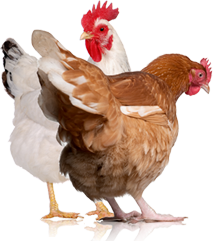 Welsummer: These hens can produce about four large eggs per week while being able to maintain a body weight of 6 to 7 pounds. As an added bonus, these hens do OK in the winter and can easily adjust to confinement. Much like Rhode Island Reds, Welsummers (one of which is pictured below) also tend to be social and friendly. Wyandotte: This breed lays around four large eggs per week. However, their bodies are a bit heavier; reaching an average weight of 7 to 8 pounds. They also adjust well to the winter. While they are usually friendly to their fellow peeps, they do like to be the dominant one. Chicken breeds differ dramatically. Therefore, consider what is important to you (eggs versus meat, behavior, space requirements, weather tolerance) when selecting breeds. If your chickens are comfortable—not too hot or cold—they will produce more eggs and better meat, and they will be healthier, too. In the end, research what your chickens need and what you have to offer. That will go a long way toward ensuring your flock is happy and productive. Myrna Cadena is a graduate student in avian sciences at the University of California, Davis. Maurice Pitesky, D.V.M., is a faculty member and veterinarian at the UC Davis School of Veterinary Medicine-Cooperative Extension. Poultry Science is written by faculty from the school of veterinary medicine at the University of California, Davis (www.vetmed.ucdavis.edu) and the University of California Cooperative Extension (www.ucanr.edu).